Kauko Oy was known as Kaukomarkkinat Oy until May 2016. Kaukomarkkinat was founded in 1947 to open up trade relations in a country recovering from a war. It focussed on markets untapped by other Finnish companies, and sent its representatives around the world in search of trade partners. The first order was for a 60-tonne delivery of sodium silicate shipped from Belgium to A. Ahlström Oy’s Karhula plant. The payment was made in Finnish paper. Kauko Oy tunnettiin toukokuuhun 2016 asti nimellä Kaukomarkkinat Oy. Kaukomarkkinat Oy syntyi 1947 avaamaan sodasta toipuvan maan kauppasuhteita. Tuolloin yhtiön keskittyi nimensä mukaisesti markkinoille, joilla muut suomalaiset yritykset eivät toimineet, ja edustajat matkustivat ahkerasti ympäri maailmaa solmimassa kauppasuhteita. Ensimmäinen kauppa oli 60 tonnin vesilasierä Belgiasta A. Ahlström Oy:n Karhulan tehtaille. Se maksettiin suomalaisella paperilla. Kaukomarkkinat’s Indonesian location, founded in 1952, was to remain the only Finnish company in the country for 24 years. Kaukomarkkinat was also the first Finnish company to conclude a trade agreement with the Chinese Ministry of Trade. 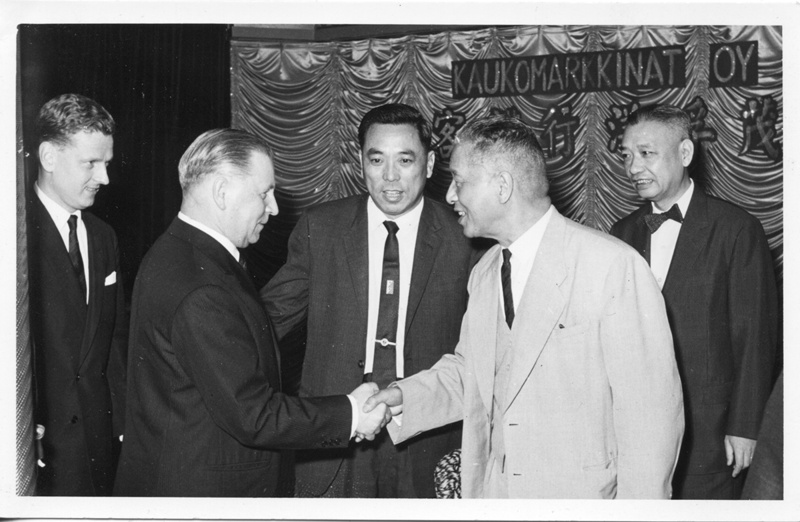 Kaukomarkkinat’s presence in China dates back to 1952, and in 1956 it was the first Finnish company to start importing from Japan. Over the years, Kaukomarkkinat earned a name for itself among consumers through the various products it imported. The text ‘Imported by Kaukomarkkinat Oy’ could be found, for example, on Technics and Panasonic entertainment electronics, Citizen watches and Adidas sports gear. When Kaukomarkkinat was acquired by Kesko in the 1990s, the trade landscape had changed. Online shops increased their sales, globalisation removed boundaries and international brands started to supply their products directly to retailers. There was less and less room for national importers. In the electronics sector, Kaukomarkkinat focussed on the needs of professionals, supplying radiophones, safety technology solutions, TV production equipment and plasma screens. The company adopted the “big fish in a small pond” approach from its Japanese principal, which meant it sought market leadership in narrow niche markets requiring special know-how. Kaukomarkkinat and Telko were merged into one under the name Kauko-Telko, operating under the marketing name Telko Group. In 2008, the conglomerate Aspo acquired the company and the name Kaukomarkkinat was again taken into use in the beginning of 2009. The previous subsidiaries were split into independent companies and Kaukomarkkinat became the supplier of solutions to boost energy efficiency, solutions to improve efficiency of operations in the process industry, and professional electronics. In 2015, Kaukomarkkinat sold its Industrial business line specializing in machine and equipment sales for paper, process and energy industries to a company, of which the management of the business holds significant ownership. At the same time company renewed its strategy and focuses now in mobile knowledge work. As a part of the new strategy company updated its visual look and main messages and changed its name into Kauko.